In the studio there is a phone that can be used for interviews and features. This will mainly be on air but there is also a way to pre-record phone interviews if you can find a time to use the main studio outside the schedule. This post will focus on using the phone for on-air, live content. PLEASE NOTE: The phone system is being constantly developed and altered to make it easier to use and these instructions will be updated periodically. The full instructions are on the training document on the left – you can save the image for future reference but it is also included here. Make sure you allow yourself plenty of time to set up the phone call e.g. two songs. The system works best when you dial out directly from the studio so you’ll need the phone number of your guest. To dial out lift the handset and press 9 before dialling the number as you normally would. Make sure there is a tone before you dial – if the line is dead your call won’t go through so you may need to put the phone down and press the square button a few times to reset it. Once your guest answers the phone you will need to run through the guest agreement with the guest. We don’t accept calls direct to the studio but it dials out on 01784 430005. The phone call plays out through the ‘TELCO’ channel—it acts just like a MIC channel so put the fader up to talk on air. You can put the phone down while you conduct the interview, these settings ensure you can’t hang up! CUE/PFL the channel to check the levels—you can adjust the TRIM to make it louder or quieter (make sure your caller is close to their phone). Pressing LINE HOLD will allow the caller to hear what’s playing out – only do this when you’ve finished talking to them about the interview as they will struggle to hear you! Make sure you take the phone off CUE/PFL on air otherwise it’ll sound distorted. You may want to duck your microphones while your caller is talking to get a better sound. Calls tend to be VERY quiet. Make sure your caller is close to their handset and speaks loudly and clearly. You can turn up the TRIM and also the EQ dials above but make sure these are reset after the call. If you have pre-arranged your interview, send a copy of the Guest On-Air Agreement beforehand so your guest has a chance to understand it – it will also cause less stress with you explaining it before the call. There is a talkback facility that allows you to speak to your guest off-air via MIC 1 without having the handset. This is still in testing and training will be updated when it is less complex. 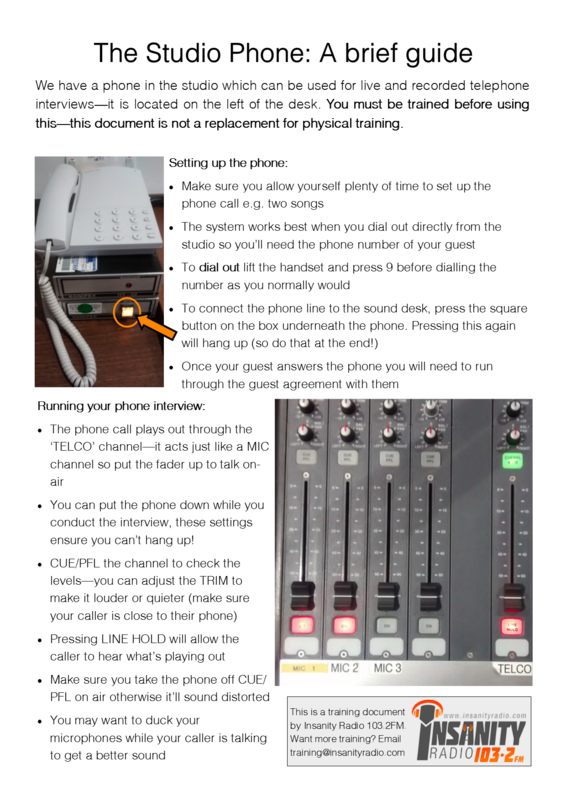 You can still use CUE/PFL to check levels whilst speaking to your guest off-air via the handset, but make sure the handset is kept away from the mic otherwise it will feedback. One way to get content for your shows is to record clips outside of the studio and we have two recorders that you can use to do that – the Tascam and the Zoom. These are especially useful for members of the News Team and the Music Team but anyone can use them as long as you’ve been trained – you can ask your team leader or the Head of Training for this. Before you use one of the recorders, you’ll need to request it from a board member and then sign it out on the sign out sheet. Make sure you state the purpose and which recorder you are signing out so we can keep track. You cannot take the recorder home overnight and you are responsible for it whilst it is signed out so look after them and report any damage or technical problems to the board so we can sort them out. Make sure you sign it back in when you return it too! 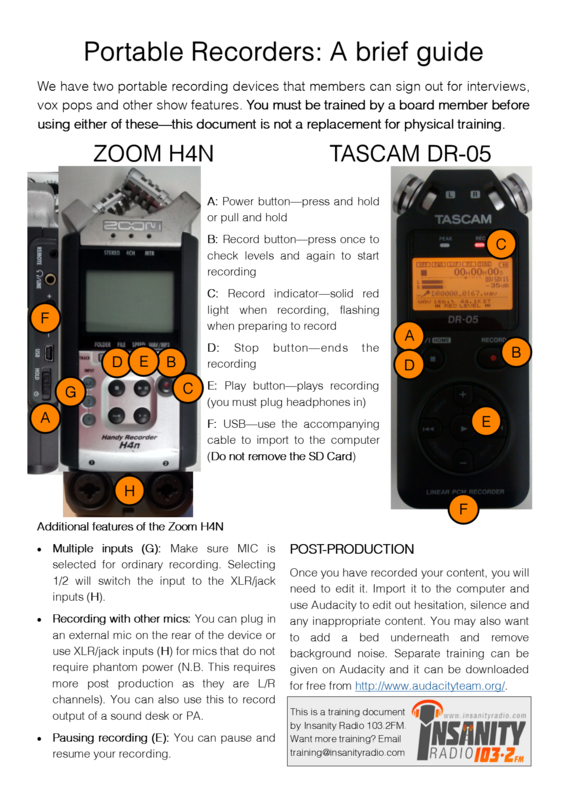 Using the Tascam/Zoom is really easy and the instructions are on the document below – you can click the image for a bigger version and a pdf is available via email! If you feel like it went badly, chances are that there was a moment in your show when something happened to throw you off. Being able to reflect on what you said/did can help you avoid the same situation happening again – perhaps you tried to discuss a topic you weren’t confident about or you struggled to turn the mics on. Having a recording of your show means that you can share it with friends and family, who can give you feedback on what they liked and what they’d like to hear more of. These are the core listeners for your show and can help you gain an audience if they genuinely enjoy what they hear. If you had a particularly good show you can use the recording to create a podcast. This can reach more listeners and those who missed out on your live show can catch up. It’s also a good idea to keep a record of bits of your show that you are particularly proud of. There are multiple opportunities to enter awards, both as an individual or as part of the station as a whole, and these often require demos – basically a compilation of your best bits. If radio is something you want to go into as a career then a good demos should hopefully help you to bag your dream job. You then need to find the file for your show – each one is in the format YYYY-MM-DD-TT.mp3 (T meaning time). As shown above, the time in the file name is the start of your show and the time printed at the end is the end time, with the files saved in hour long slots. If your show is two hours long, make sure you save both files! To actually save it, right click on the blue hyperlink and select ‘Save Link As’ or ‘Save Target As’ (depending on your browser) – this will allow you to save the file to your USB stick or directly to the computer. There will be more training material on podcasting, demos and how you can use your logs later in the term but for the mean time enjoy listening to your shows on the logs! You’ve probably seen and been trained briefly on Hour Modes, but what are they and why are they so important? Let’s explain. The log (essentially the big playlist that contains ordered songs that’s on the right hand screen) is split into hours. Every hour, the clock essentially resets. The “TOP OF SHOW” thing that appears when you plan your show is known as a Top Of The Hour/TOTH, and often in radio there are news bulletins exactly at X:00. Usually, we want this to play as close to 00 as possible, otherwise we get either overrun or underrun. Overrun is when an hour has too much content, and underrun is when it has too little. Both are completely preventable, and I’ll explain how to after we define each of the different modes. Each hour in the log has a specific mode – one of the following 3. You can change the mode in the studio as you feel fit by clicking one of the 3 buttons on the top right screen. This is the only mode where stops (red squares) have an effect. This mode is aimed for hours where a presenter will be in the studio, and automatically loads music into Cart Players ready for them to play to assist them. If there are stops in the log, Auto will completely ignore them. This is useful if you have to pop out of the studio for a couple of seconds, but don’t want the system to top it up with music. Overrun and underrun won’t be resolved by this. (This mode will only work in the studio that’s on air.) AutoFade will try its hardest to automatically time the music to finish EXACTLY at X:59:59. If it can’t, it will fade songs out early. When no presenter is on air, this is recommended, as it is the most accurate. It’s also recommended for pre-recorded shows. The “Hour Mode” buttons are the three above the top. Note the “On Air” one in green. When the hour is on LiveAssist, your show will play as normal, even if you’re not in the studio. That means that if the log hits a stop, the music stops, and silence goes out on air. This is very bad and unprofessional. 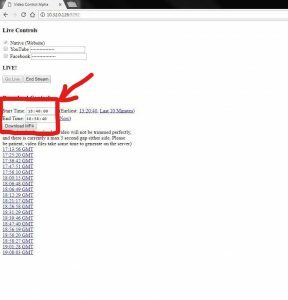 DON’T put the hour mode onto LiveAssist if you’re planning your show a while in advance, and definitely don’t put them in pre-records! A studio with nothing playing out – disaster! When you complete your last link, it is very advisable to put the log back onto AutoFade. This will ensure that you have no overrun or underrun, and is fair on the next presenter, and is the professional’s choice. Don’t be scared, after a couple of shows this will all become second nature to you! Let us know if you have any questions.